Every experience I’ve had at Little Market Brasserie in the Talbott Hotel has involved a surprise. When having their delicious brunch on the outdoor patio this summer (hel-lo smoked salmon on crispy potato hash with cream cheese and capers) I was shocked to know that that the awesome acoustic music coming from inside the restaurant was actually live (the waiter came up and told me when he saw my iPhone foisted into the air, Shazam app frantically swirling and coming up empty..FYI..the singer is Michael Jansen, I later learned, of the Chicago band Mighty Fox). And during my more recent visit earlier this week, an even bigger surprise was revealed when I learned of the bounty of sweet-tooth, trick or treat heaven on a secret sundae bar. OK, maybe it’s not so secret as every Monday night, your vanilla, chocolate or swirl soft serve serves as the perfect blank canvas for the gummy worms, Swedish fish, dark chocolate disks, toasted coconut, candy corn, fresh berries and kiwi, crushed brownie bites, graham cracker crumble, sprinkles, oh god, there was more, and toppings like salted caramel and housemade magic shell. Why this bounty isn’t served nightly is beyond me (OK it’s probably to give the space back to the bar on busier nights), but we couldn’t think of a better way to start the week. All this was after an array of excellent savory comfort food dishes on the menu from mushrooms on toast slathered with shallot marmalade, a corn agnolotti with chorizo, grilled butternut squash with quinoa, and the sent-from-heaven grilled cheese of the month Melts for Meals created by Chef Andrew Zimmerman…somehow, we managed to find room. 10 E Delaware Place. 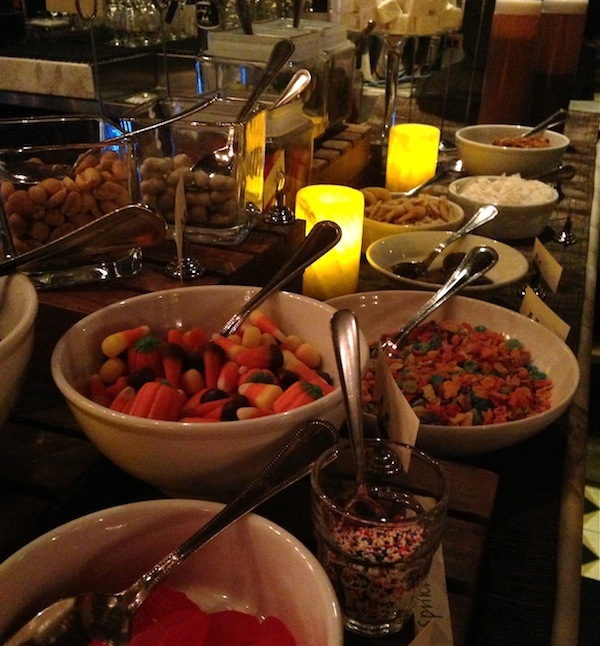 The sundae bar is definitely more treat than trick.